In their penultimate game of the season, the 1st team put in a sterling second-half display against Wisbech Grammar to come away with a positive result. In the opening exchanges, the width of the pitch was not used very well at all and the boys tried to play a lot of their hockey up the left-hand side. Pleasingly this improved enormously as the game progressed. Charlie and Ben switched the direction of attack repeatedly, recycling the ball well down the right-hand channel. This enabled Oscar and Harry to provide excellent service to George who scored a superb hat trick. Wave after wave of attacks followed and the boys were deserved 6-0 winners. They now look forward to playing Worksop College in their final game of the season and will be looking to end the term unbeaten in their last six games, which would be a tremendous achievement. On Wednesday afternoon, the 1st VII played their final fixture of the season against Worksop College. In a very tight first half, both teams had some good chances in front of goal, with the 1st team edging what was a thrilling 20 minutes. At half time with things at 0-0, the game was in the balance and one goal from either side would open things up. Pleasingly, Witham scored a superb opening goal to take an early lead in the second half and from then on in, put in a fine display. In what was a complete performance, the ball speed, stick skills and fine finishing led to a 6-0 victory and 6 games in a row unbeaten. It has been a superb second half of the term and one that will live long in the memory. All of the senior hockey squad this term are to be commended for all their efforts, well done. The penultimate match for the 2nd’s saw them take on a visiting Wisbech side. From the start, Witham attacked, moving the ball well. It was not long before Rupert P. opened the scoring with a fine finish. Henry Farmer doubled the score for Witham, again with a great finish. Wisbech had their chances, but thanks to some strong defending, the half time score remained 2-0 to Witham. After the break, Wisbech came at Witham and the home side was looking a bit shaky at times. However, the boys kept their nerve and a hat trick from Guy H. and another goal from Rupert P. gave Witham a commanding lead of 6-0. Credit to Wisbech, they never gave up and got their reward by scoring a goal in the last minutes of play. A great match all-round. Well done Witham! The final match of the season was against Worksop U13B’s. The Witham boys started very brightly and it wasn't long before they took the lead thanks to Rupert P. Worksop fought back but slick passing from Witham saw them take a 3-0 lead at half time, thanks to two goals from Henry F. After the break, the Witham boys came out fighting again. A goal from Rupert P and two goals from Guy H, gave Witham a commanding 6-0. Jake L. added a 7th goal after a well-worked move. However, credit to Worksop, they never gave up at any point and after some confusion in the Witham defence, they scored. The final whistle blew and a 7-1 victory to the 2nds. A super end to a great season. Well done boys! The 3rd VII produced a fine performance to cap a superb season. The energy and desire were high, the passing crisp, the movement off the ball effective and the finishing precise! Two early goals established a good footing, but the one that followed was undoubtedly the goal of the season; two-touch hockey between four players, six passes and a first class, well-placed shot. A coach’s dream! The impressive performance continued throughout the second half, although the Worksop goalkeeper continued to do his best to thwart the Witham assault on his goal. Well done to him, and well done to the Witham boys. 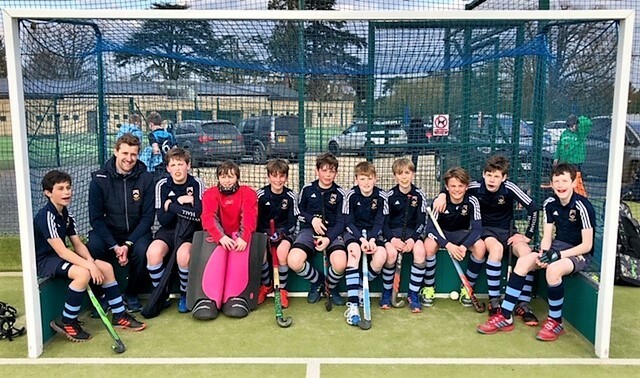 On Wednesday afternoon, two Colts hockey teams played in triangular events against Stamford Junior School and Wisbech Grammar School at Witham. In the first round of matches, Witham played Stamford. In tightly fought, end-to-end games, the Colts came out with positive results in both, with some excellent team play on show. In their second round of matches, the boys played Wisbech. A real highlight of these matches were the excellent stick skills on show from all the Colts; everyone looked comfortable, calm and composed on the ball. Both Witham teams cannot be faulted for their tremendous attitude throughout the afternoon and the camaraderie on show was great to see. Four wins from four matches is a tremendous achievement. 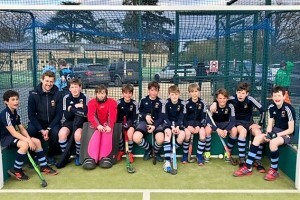 Both teams played some good hockey on Saturday afternoon and showed real grit and determination to do well. Witham started strongly in the first half, playing excellent counter-attacking hockey. In the second half, the boys scored off a short corner, with Alfie injecting it to Hugo, who slipped the ball under his left shoulder to Angus, who swept it across to Oliver with a fine finish. Some good hockey was on show throughout – well-done boys. Colts B’s started slowly with the ball travelling up and down the middle of the pitch for much of the first quarter. After the first interval, the use of the pitch was much better with the boys staying in their positions creating much more space, into which they were able to move the ball. Pressure from the forwards resulted in a number of opportunities. The Wisbech keeper made some effective saves from the shots on target. Wisbech did have their opportunities but the Witham goalkeeper dealt with shots admirably. The Witham defence was able to clear the ball competently, turning a defensive situation into an attacking one on numerous occasions. All the boys played their part in a well-deserved victory. With the sun shining, the Witham Colts B/C team headed to St. Hugh's to play in a triangular with their B’s & C’s. Up first was St. Hugh's B team. The match was end to end with both teams creating chances. Freddie H and Kit H stood strong in defence and cleared the ball to safety. Archie P worked tirelessly in midfield, alongside Luke W and Isaac F-K. However, despite both teams’ best efforts, the final score was 0-0. A short break and Witham were back on the pitch, but this time facing the St. Hugh's C team. This match had a frantic pace to it with both teams battling hard and creating chances. Witham opened the scoring thanks to a nice finish from Harry T. However, shortly afterwards, St. Hugh's equalised. Will D. made some great runs down the wing, crossing the ball in well and giving his attackers opportunities to score. Witham took the lead thanks again to Harry T. Once again, St. Hugh's came back and equalised - 2-2. Harry S was called on a number of times and made some great saves and clearances. Nevertheless, it was to be Witham’s day and up stepped Harry T again to score the winning goal to give him his hat trick. A super team effort from the boys, well done! On Thursday afternoon three U9 mixed hockey teams played Stamford Junior School at Witham. In perfect hockey playing conditions, all the Witham sides put in some tremendous performances. As the afternoon progressed, the passing and movement on the field of play improved no end and some super team goals scored. All the games were very much end-to-end contests and the sportsmanship on display spot on. It was a fitting way to end the term and all the Year 4 boys should be immensely proud of their achievements on the football and hockey pitches. A big thank you must go to the parents for supporting the boys throughout this term, it really is greatly appreciated. 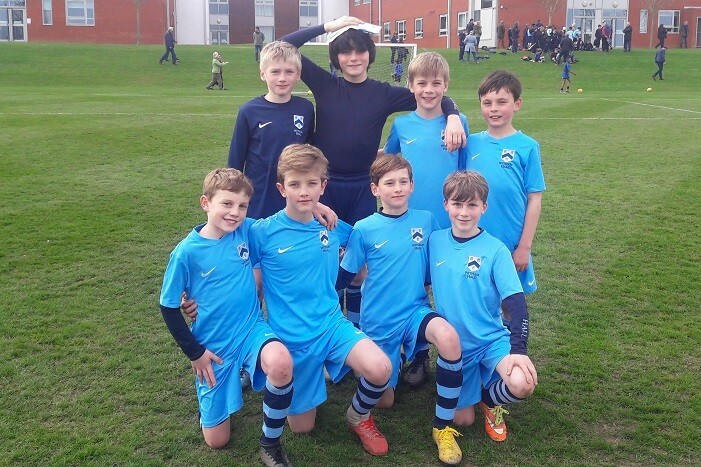 The Colts A footballers concluded their season with an entertaining and eventful match at Leicester Grammar School. The first half was fairly even until Witham opened the scoring just before the break. Angus made a terrific run down the wing before the Leicester goalkeeper parried his powerful shot; luckily, the ball arrived at the feet of striker Thomas who kept calm and side-footed home. The half-time team talk focused on the importance of getting the next goal, and Witham did just that when Thomas doubled his tally with a sublime shot from the corner of the penalty area that left the goalie with no chance. Our boys then played some lovely football and it was soon 3-0 thanks to an excellent right-footed shot on the turn from Harry, who had come on as a substitute to make his Colts A debut. However, the hosts pulled a goal back when their striker got the better of Witham’s defence, and then with just five minutes left they made it 3-2. Witham goalkeeper Seb had to go off after a painful knock so Hugo took the gloves. There then followed a spell of intense Leicester pressure as they piled players forward in search of a late equaliser, but Witham held firm with the novice goalie making some outrageous – and unorthodox – saves. The final whistle eventually blew and our boys dropped to their knees with a mixture of celebration and relief. In their final match of the season, the Colts B returned to Leicester Grammar School. Playing LGS U10A the game started very competitively, with both goalkeepers called into action early. LGS got on the scoresheet first, forcing an own goal from a corner and a second goal soon followed. However, Witham continued to apply pressure to the LGS defence with Henry striking the crossbar before getting a goal back for Witham on the stroke of half time. HT LGS 2-1 Witham. The second half continued much in the same vein as the first, LGS scored after 5 minutes only for the outstanding LGS keeper to tip a fierce shot from Henry on to the post and out for a corner. LGS capitalised on Witham mistakes further, with another goal from the penalty spot. Witham continued to play nice football but struggled to break down the defence. In the final act of the game, Witham loaded the box to try to score a well-earned second goal, only for the ball to break to the LGS striker who scored with the final play of the game. Despite losing 6-1 the scoreline does not do justice to the quality of the Witham display, nor the excellent season all these boys have had. They have all represented the school superbly and should be very proud of their achievements. Well done boys. The size of the pitch had a big influence on this game. The narrowness meant that most of the play was in the middle of the pitch so creation of space was an important skill for the boys to master. Although the goals were very small, Leicester managed to hit the back of the net with regularity. The scoreline would have been even greater without the magnificent saves by Marcus in the first half and Will in the second. Albie ran after every ball and showed great determination in the tackle. Elias made some accurate passes and cleared the ball effectively when in defence. The game was not as one-sided as the score may suggest and Witham had their chances but was unable to convert any.